If you hadn’t heard, Rare recently held a contest where its winners would be the first in the world to play Sea of Thieves. Along with the six successful winners, six more lucky superfans were able to accompany them for the experience. I was one of the six lucky superfans who went on this epic trip and below is everything I learned about Rare’s upcoming pirate adventure! The build of Sea of Thieves that we played was primarily focused around how crews interacted with ships in the huge sandbox offered by the game. The game was an absolute blast and there is so much to share. I am going to break down what I played into sections so it is easier for me to explain, and so you all can easily digest everything I was able to play. In each of our play sessions we were arranged in groups of four players. In terms of managing the ship, this number seemed fitting. We were consistently challenged, but also were not overwhelmed while sailing or engaging in battle. Every player in the world had their gamertag displayed above their head when you were in close proximity. Players in your crew had their gamertag displayed in green text, and players not in your crew had their gamertag colored orange making it easy to see who was a potential threat. There are no assigned roles or classes. Every player in your crew is equal which made it very fluid and simple to control the ship. In one moment a player could be firing cannons and in the next that same player could run below deck to start repairing holes from the last encounter. A player who was just in the crows nest could easily jump down and start raising or lowering the sails. The captain of the ship steering the boat into battle can simply run to the cannons and start firing if the path ahead was clear. Communication with your crew made it so there was no time wasted. It was in your best interest to coordinate who would be steering the ship and who would run below deck to repair holes. This planning led to efficient sailing, but a crew who knew each of the functions of the ship could get by without talking to each other. 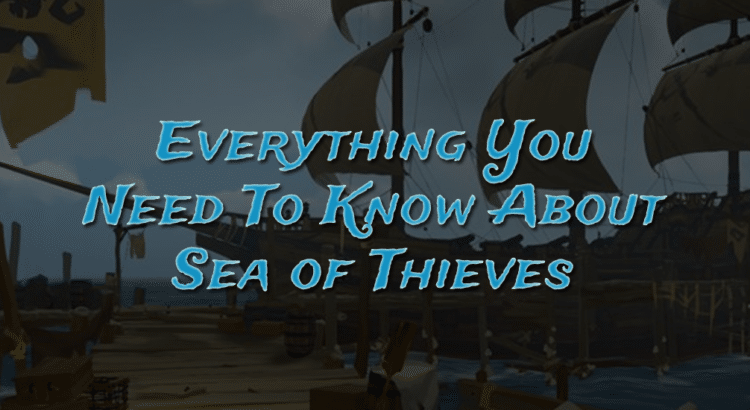 Sailing the ship itself was quite easy once you understood the key components of sailing in Sea of Thieves. Before playing the game we weren’t given any instructions, or told what to expect. Once in the game, there wasn’t a tutorial to be found and within minutes we were still able to sail our ship into the open seas. In the build we were playing, to successfully start moving our ship, we needed only to raise the anchor and lower at least one of the sails. A crew member at the ship wheel isn’t necessary to set sail; but probably won’t be the wisest decision. If you were looking to gain speed, your crew could lower the sails on the other two masts, but again not necessary to set sail. Now you might be thinking the number of steps is small, but how complicated are they to perform? Raising the anchor, lowering the sails and steering the ship were all approachable and intuitive. Raising the anchor consisted of one to four crew members interacting with the capstan which raises the anchor by cranking the device around its axel. One person could raise it on their own, but each crew member that joins will speed up the process. Raising and lowering the sails was as straight forward as interacting with the pulley that controlled the length and pressing up or down on the left stick to raise and lower. As for steering the ship, a crew member just used the ship wheel and the left thumbstick. It was easy to tell if your wheel was currently centered or turned all the way to the left or right thanks to gold pegs rather than wooden ones on the wheel signifying each of the three positions. Along with the gold pegs is small haptic feedback in the controller when one of those three positions is hit. 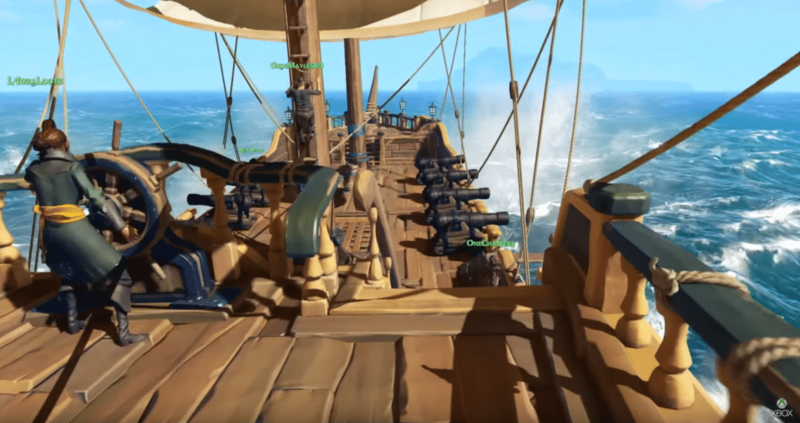 It was amazing to experience how straightforward Rare had made sailing in Sea of Thieves. Now to fully utilize the ship, you need to be watching the wind which was clearly visible while not being distracting. The wind takes the form of small, thin, white lines in the air drawn in the direction of the wind. There was a separate pulley for each mast that would angle the sails. Any crew member could use these to turn the sails to catch the wind. As soon as you had the correct angle the sails would puff out visually letting you know that you were catching the wind. Having your sails angled correctly would grant you significant speed. If you had a sharp turn to make, you could raise the sails about half way which of course would make your ship travel slower, but allow for a sharper turn as you were traveling less forward and more into the turn. As I mentioned above, everything regarding controlling the ship was self explanatory and extremely intuitive. The only consequence of not fully grasping how to sail your ship would be lack of speed. Though from all the visual queues given and simple controls for each action to sail the ship, it shouldn’t be a problem for any crew. I will mention it is definitely possible to command one of these huge ships on your own. One person could raise the anchor although slowly, lower the sails half way to not block their view from the helm and run up to the ship wheel and steer the ship to their next point of interest. Throughout the several playthroughs, my crew never experienced a loading screen (minus spawning) and didn’t run into any barriers. The game world is populated with numerous gorgeous islands covered in sand, rocks, trees and plants. Anything you see you can sail or swim to. Since the anchor can be lowered whenever you please, it was very easy to explore the world. We would sail to any island we were interested in, lower the anchor and swim over to it. It was a very powerful feeling to control this massive ship and still feel small compared to our surroundings. The game is using Unreal Engine 4 and it is absolutely stunning. There is a day/night cycle with amazing looking sunsets and sunrises. The sky was accompanied by beautiful waves as far as the eye can see. Your ship interacts with the waves just as you would expect by rocking back and forth. The physics with the waves made the game world very grounding. What was particularly impressive was the absence of character clipping aboard the ship while it was rocking back and forth. We weren’t sliding around the ship and the first person view was very solid. There are manmade buildings on the islands. 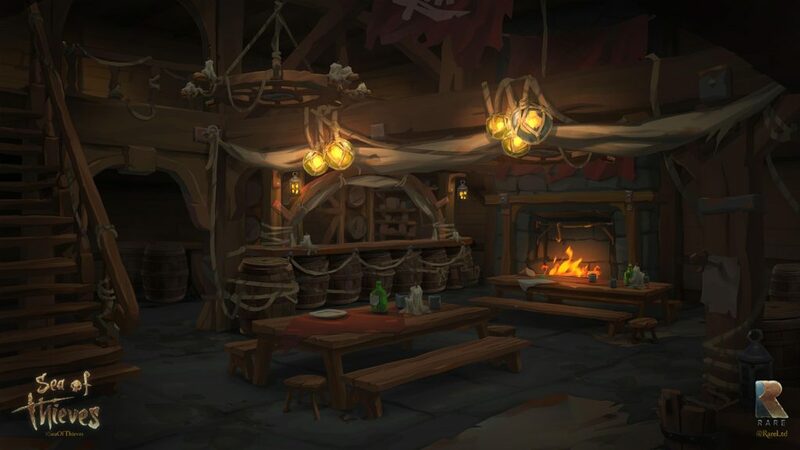 One island we encountered had a tavern very similar to the concept art you might have already seen. In our play sessions we had three crews of four people exploring, sailing and duking it out in the same world instance. Commanding a ship in a battle against two other ships, while traversing the open seas, was very unique. Each side of the ship was equipped with four cannons. In the build we were playing we had unlimited cannonballs, so as soon as my crew thought we were in range of an approaching ship, several of us jumped on the cannons and start blasting away. With the waves sometimes blocking your view and depending on how far away the opposing ship was, it could be challenging to tell if you were making contact with your cannon fire. In Sea of Thieves to let the player know how successful they are with their barrage of cannons is an audio queue for each successful hit. If you made several successful hits the audio queue strung along a grand pirate tune that would fully play out once the enemy ship was sunk. It was so much fun as my crew fired at the enemy ship to hear each of us yell, “I got music!” for each hit we scored. 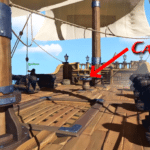 As the player using the cannon, even with the audio queues, it could be difficult at times to see if you were even close to connecting cannonballs to a distant enemy ship. We took advantage of the person using the ship wheel to help the cannon wielders direct their shots. 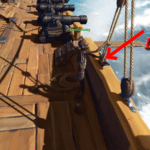 The ship wheel is placed higher on the ship so the captain can simply tell the cannon shooters to aim higher or lower by using their height advantage. As our ship took hits from the enemy cannons, the hull of the ship spring leaks. If no crew member was below to see these leaks, it would be noticeable from the sound of water rushing in as it could be heard from the deck. To repair the hole you needed a piece of wood and it was as simple as holding down the interact button on the hole with your wood plank equipped until the hole was repaired. If you failed to plug up the holes in your hull, the ship sunk. There were two levels in the hull. Once the lowest level was flooded, the water would start to pour into the next higher level if there were holes in this level as well. I was one of the unfortunate players who became stuck in the hull as our ship sank and never reached the surface. One ship battle tactic used on us was an opposing player lowering our anchor in the middle of battle. You are able to run freely on the ship and jump on and off it with no problem. In the middle of a battle, as each ship passed by each other in parallel exchanging cannon fire, an enemy player from the opposing ship jumped off their ship onto our ship. Once aboard they ran over to our capstan and lowered our anchor immediately, stopping our ship and leaving us dead in water as the enemy ship circled us taking shots. Another tactic we learned during battle is to aim your cannons low on the opposing ship. Since each ship’s hull has two levels, you want to try and put holes in the lower first so it will sink to the next level in the hull. Shooting holes in the level above the lowest isn’t productive as the water isn’t high enough to seep in. During sailing when the sails are fully down, the player steering the ship is blind. The other crew members during this time need to watch out for rocks and upcoming obstacles and relay these threats back to the person steering the ship. While in battle when everyone’s focus is on the other ship and not where they’re going, a strategy we used was to raise the sails half way up. This would still give us some speed to maneuver, but would also make what was ahead visible to the captain. If you were heading towards a rock protruding from sea, or needed to turn around on the spot for a better line up during battle, we used a strategy of lowering the anchor while traveling at an acceptable speed. This would stop the ship and flip it around the lowered anchor. Something very interesting about the development of Sea of Thieves is that along side the Unreal Engine game is a prototype of Sea of Thieves that is continuously being worked on. This prototype is used to test features and gameplay mechanics in a quick and responsive manner. Due to its primary focus being gameplay, the prototype is in a very raw state graphically. An example of something the prototype would be used for is testing the size of the ship. Rare mentioned that even taking a foot off from the width of the ship could change the flow of players sailing. Being able to test the affects of this kind of change without having to include the artists and modelers is very beneficial. This idea of exploring gameplay with little risk and cost is very exciting. It would be easy for some fun, but experimental ideas to be shot down because the time and risk of implementing the idea just for it not to work out could be costly. 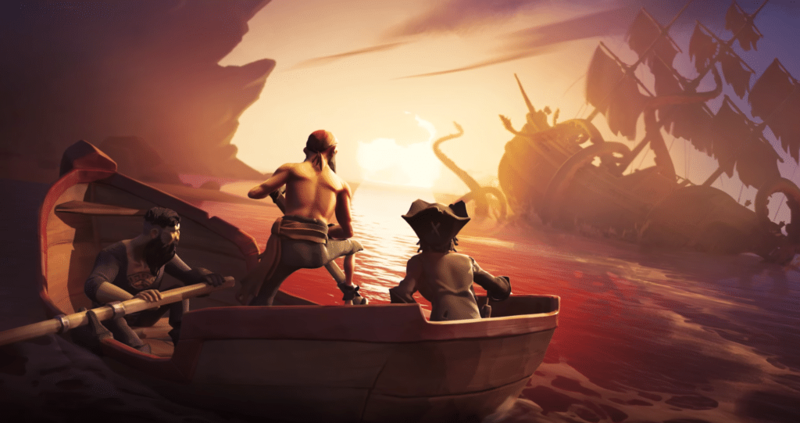 Having this risk free environment will really let Rare explore all the possibilities that could be implemented in this shared pirate world. So that is everything I can tell you about the Sea of Thieves build we played. As I mentioned this build was about the ships. With just the core ship features we played, Sea of Thieves allowed for very dynamic gameplay that resulted in a lot of laughter and memorable moments. Since the visit to Rare ended, I have been eagerly awaiting my next chance to play Sea of Thieves. I am even more so looking forward to playing the game when some of the elements hinted at in last years E3 trailer such as sword fighting, treasure hunting and skeleton enemies are included. For more on my experience that goes into more detail of the islands, graphics and sound, be sure to read my other hands-on article. If you have any questions, leave them below and I will do my best to answer them!